Studio Canvassa - Singapore's Hottest Canvas & Laminate Printer! Singapore’s hottest canvas & laminate printer! Send us your photos, artwork and digital images for printing onto canvas or laminate photo paper. Our clients come from all walks of life, which includes professional and amateur photographers, artists, interior designers, freelancers, hobbyists, individual retail and commercial clients. There is no minimum order. Feel free to enquire today! Certain memories will always hold dear in our hearts. These pictures should not be kept but deserve to be showcased and displayed. The grainy and subtly reflective surface of our canvas prints brings depth to your pictures, rendering it more life-like as opposed to a standard print. 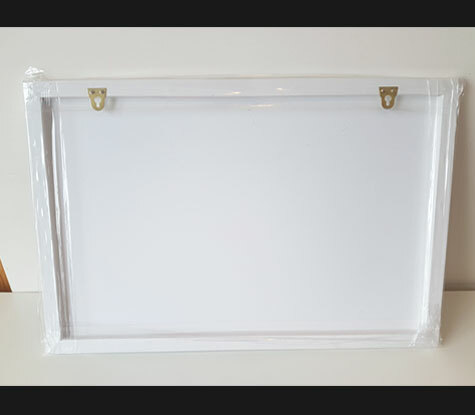 Protective glass is not required for canvas framing so image can be seen clearly without any reflective glares. Have your wedding pictures, your child’s first performance and graduation, your honeymoon travelogue, family portraits and precious art works printed on canvas for you and your loved ones to enjoy. It is truly an investment in itself. Saturated and rich colour tones. Checking of photo resolution for print. UV protected (no direct sunlight). Learn how to care for your prints here. 100% heavyweight cotton (non acidic). Professional studio quality. Click here for more info. Fujifilm photo paper, coated with matte plastic laminate. Professional studio quality. Click here for more info. Only high quality wood is used for framing. We offer classic picture frames, wooden stretcher bars and scroll bars. Click here for samples. Starting from $28/hour; minimum of two hours. Located one minute away from Macpherson MRT. Click here for photos of our studio. We do custom designs for quotes in any size or format! We can also turn your photos into a stylised painting or caricature. Click here to view our album, and check out our Instagram feed as well! We can correct blemishes, lighting and colour tones of your photos. We can also superimpose any text onto them. Pro studio grade, ready to hang. 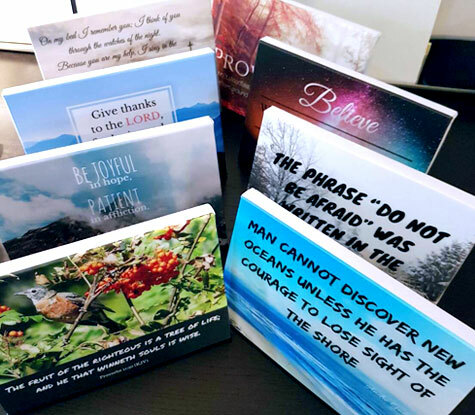 Thicker borders available, click here to view. Sizes above 18" x 24" are considered large. 1 1/2"(+$8) and 2" (+$15). We print other dimensions as well be it square, rectangular or panoramic. Enquire today! Minimum booking of 2 hours is required. Office Hours: 10:00 - 19:00. High table with 6 chairs. Hair dryer and basic hair styling products. Payment in cash or via bank transfer only. A 50% deposit is to be made within 24 hours to reserve your slot. A cash deposit of $200 is required upon checking in, for payment against any accidental damages or refusal to clean up. A full return will be made after everything has been checked to be in good order. Click here to view prices for regular photo prints, caricatures, digital paintings, thumbprint art, pre-made quotes and more. Are you still unsure or have more questions? Feel free to drop us a message, we'll be more than happy to assist you one on one! Email your picture to hello@studiocanvassa.com Do provide us with high resolution photos at least 2MB in size for best effect. We are able to print handphone pictures as well, but reduced quality of print to be expected. Upon confirmation, payment will be collected before we begin the production process. Click here for detailed visual instructions. 10-14 days including delivery, subject to unforeseen circumstances. 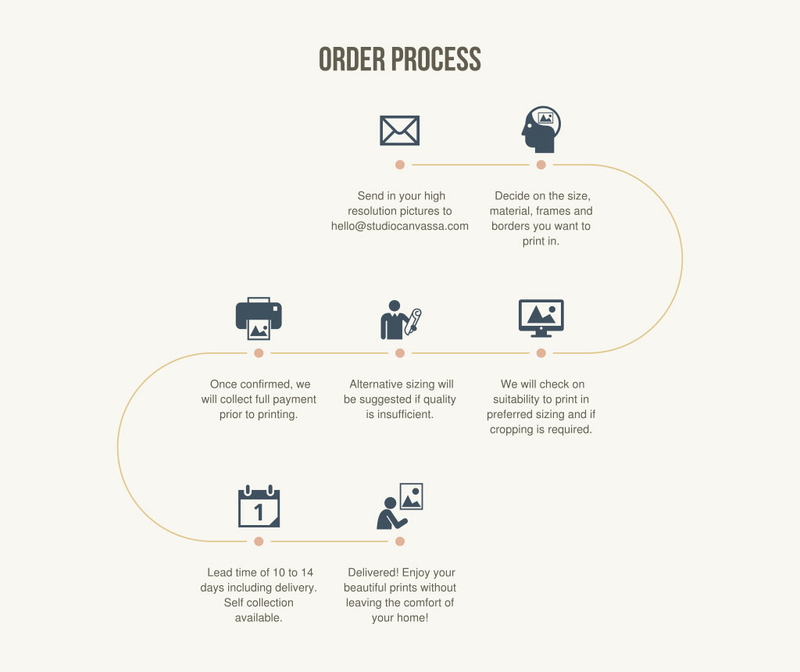 We do not work on rushed and last-minute orders, quick turnaround or short lead times. We focus on quality work and quality work takes time. After printing, we need to out-gas and dry the inks for the most accurate colour to come through. This will also prevent air bubbles, ink-smearing, sagging problems in future. The minimum time needed is 24 hours but in a humid environment, 48 hours is recommended. Thereafter we work on the coating process. Click here to learn more about the canvas printing process. We check each & every picture prior to collecting payment. We will recommend on sizing as well. Even after printing, if picture is deemed to be unusable (by us - don’t worry, we are stringent), we will promptly refund you in full. $10 for courier, arranged to your convenience, full SMS service. Free delivery for orders above $150. Sure, do drop us an enquiry at hello@studiocanvassa.com and register an account with us. We can represent your company (without identifying details). No problem, as long as pictures have not been printed. Anything that can be viewed on screen or scanned. How do I Send My Images Over to Studio Canvassa? No. We are operational online as our mission is to save you time and hassle when it comes to printing your canvas works. Ordering is done in the comfort of your home! Good printing takes time to produce, and as such, there is no reason for us to have a shop space. This way, we pass on the savings to our customers and are better able to offer higher quality prints. Am I Able to View Samples? Please SMS 9740-3353 to arrange an appointment. Do you Edit, Colour Correct or Redesign Pictures? Will Colours Look the Same on Screen and When Printed? It will be very similar, but unfortunately, based on current technologies there is still no way for colors to be 100% the same. Yes we do, in denominations of $5. We offer laminate printing as well, which is just as beautiful but carries a different aesthetic. Please click here to learn more on the differences.